Norman Osborn's attempt at duplicating the powers of the Super-Adaptoid failed miserably, leaving both his body and mind in complete shambles. But Goblin attacks do not cease when Osborn is temporarily out of the picture, in fact, it usually means quite the opposite. The mad-dash for one of Osborn's prized possessions commenced in a story arc featured in Amazing Spider-Man #695-697 entitled Danger Zone. Phil Urich, the former heroic Green Goblin, had succumbed to his inner demons and taken on the mantle of the villainous Hobgoblin. Convinced he had killed the original (Roderick Kingsley), Urich went on a crime spree and eventually found himself in the employ of the Kingpin. However, Urich's assessment of his success over the original Hobgoblin was misguided, as Kingsley eventually emerged from the shadows to exact his revenge on Urich. 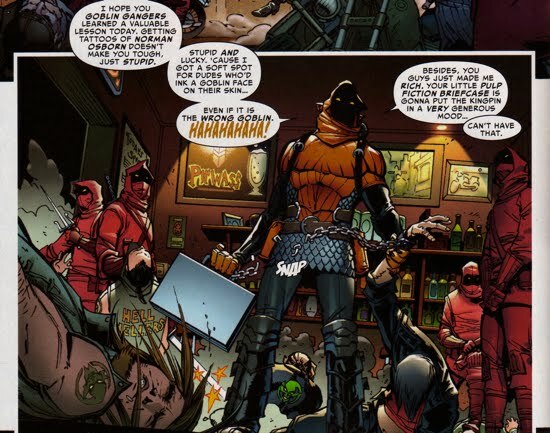 According to Kingsely, Urich had killed his brother (Daniel), who had been operating as the Hobgoblin at the time. Phil was completely unaware of the tidal wave headed his way. Under the direction of the Kingpin, the Urich-Hobgoblin was tasked with retrieving a briefcase that was currently in the possession of The Green Goblin Cult. The cult members, which for all intents and purposes was basically a biker gang, were located at a bar in Brooklyn and it took minimal effort on the Urich's part to dismantle the group and relieve them of their briefcase. Unfortunately for Urich, Spider-Man was keeping tabs on him and the web-slinger stole the briefcase from Urich with ease. Assuming the briefcase was booby-trapped, Peter hid the case in his Horizon Labs locker until he was ready to deal with it. 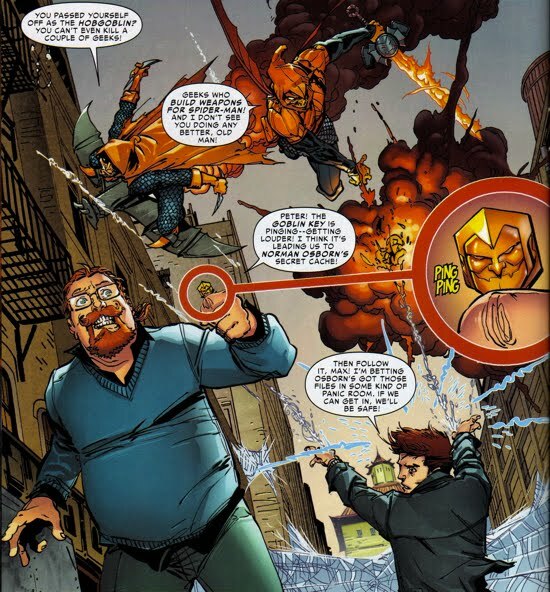 After Tiberius Stone, a fellow Horizon Labs scientist, activated an a Spider-Sense-jamming weapon, Peter Parker's Spider-Sense went into overdrive and nearly incapacitated him. 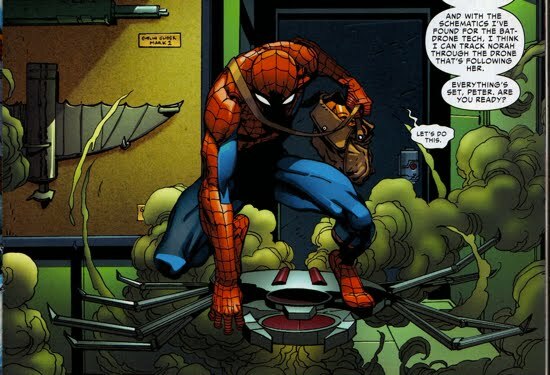 Since it had just become public knowledge that Peter builds Spider-tech for Spidey (thanks to a report from the Daily Bugle), Urich saw the opportunity to nab Parker and force Spidey to return the briefcase in exchange for Peter's life. 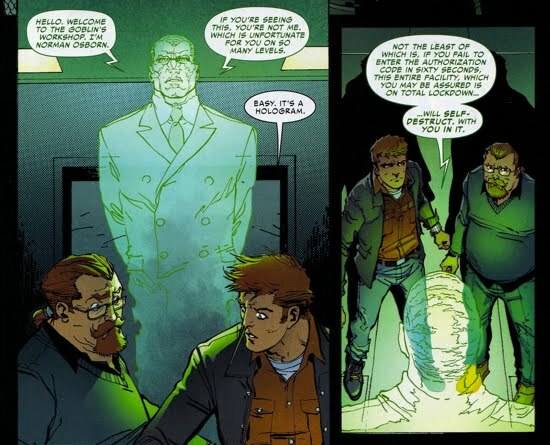 Urich did so, and soon after Peter found himself shackled in the Kingpin's lair (ie, Shadowland). "The Goblin Key...Norman Osborn's most valued cache of assets. From his Goblin tech to the secrets he amassed as head of the H.A.M.M.E.R. national security agency. There is no greater treasure trove in the world." However, the Kingpin did not get to relish in his success for very long, because the Kingsley-Hobgoblin arrived on the scene and all hell broke loose. 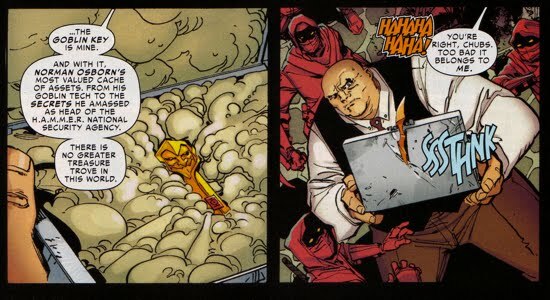 During the ruckus, Peter was able to stave off his pain from the anti-Spider-Sense tech and steal the key right from under the Kingpin's nose. As the Hobgoblins battled it out, Peter and Max high-tailed it out of the Kingpin's stronghold...but the Hobgoblins put aside their beef and quickly followed in pursuit. With the Hobgoblins hot on their trail, Max and Peter made a profound observation, the key itself served as a GPS-tracking device leading them to Osborn's super-secret cache! The duo eventually arrived at Osborn's hideout without a moment to spare, as the Hobgoblins' collective attack nearly killed the two scientists. 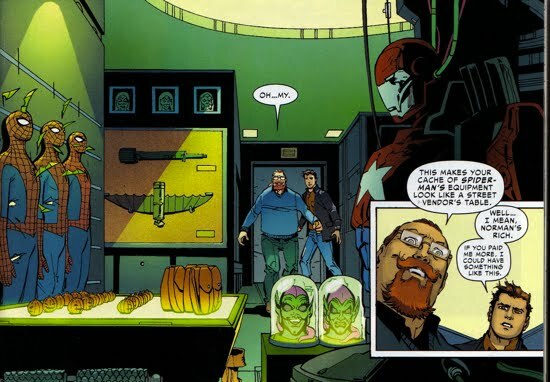 Upon entering The Goblin's Workshop, Peter and Max were greeted by a holographic image of Norman Osborn, which informed them that the hideout was about to self-destruct due to their failed authorization. 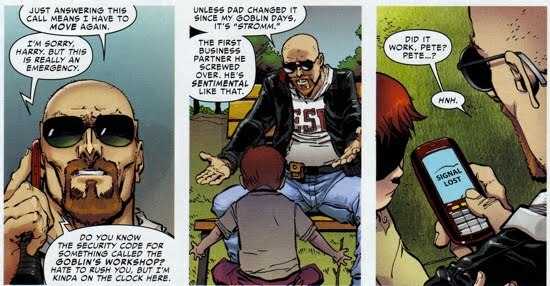 Thinking quickly on his feet, Peter contacted Harry Osborn, who was living incognito in Seattle, and he provided them with the security code "Stromm" (a sentimental choice of a passcode by Osborn). 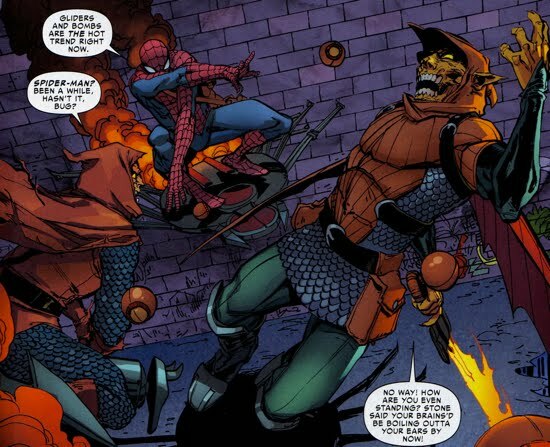 The passcode worked and Peter quickly donned a Spider-costume (which was in the workshop used as target practice) and some Goblin tech as he went to battle the two Hobgoblin's waiting outside the door. To protect Max, Spidey told him to leave via the escape hatch (Osborn's backup escape route, he's always got a backup plan!) whilst he distracted the two Hobgoblins. Modell then bailed after reactivating the self-destruct mechanism so that no one could gain access to workshop. That's right. Norman's useless body and vegetable-state brain somehow awoke from his coma and he escaped via the window of his Columbia University Medical Center room...his whereabouts are currently unknown. This was certainly an interesting little tale that kept me engaged throughout, however there was a couple of real head-scratching moments regarding the plot itself. 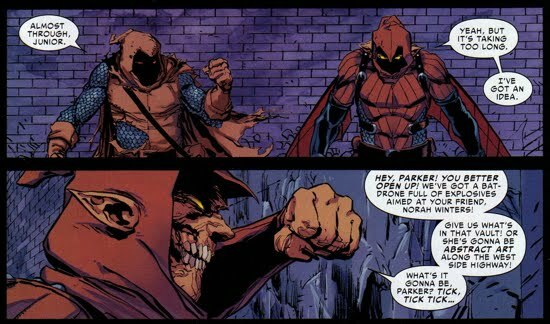 Many will recall that Osborn's affiliation with the latest Green Goblin Cult was minimal at best. They seemed to be quite inspired by him, yet he had no clue who the hell most of them are. So it was rather confusing that Osborn would have entrusted these low-life-biker-gang types with his most precious secrets, begging the question why the hell were they in possession of the Goblin Key in the first place? Did Osborn really give it to them or did they somehow stumble upon it themselves? You may recall from the Super-Adaptoid story arc that Madame Hydra had basically pulled the wool over Osborn's eyes as she quietly came into possession of everything he had built with H.A.M.M.E.R./Hyra/Hand/The Goblin Cult. So shouldn't she had been the one in possession of the Goblin Key? 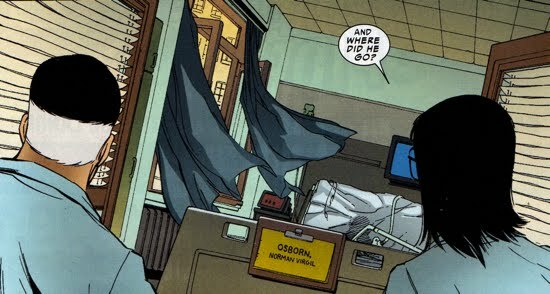 Moreover, why was Osborn (world reknowned super-villain ten times over) being held at civilian hospital and not the infirmary of the Raft or some other highly-secured facility? It seems like his escape from custody (after awaking from his coma) could not have been made easier by the authorities.